We love our Cervasi Facebook fans and followers and appreciate when they ask us questions, offer suggestions and — in this instance — give us a recipe for our archive! Our fan was inspired by our recent blog post, Instant Pot Tips for Pasta Dishes, where we shared how we’re seeing Instant Pot fans talk about how it’s great for cooking pasta. 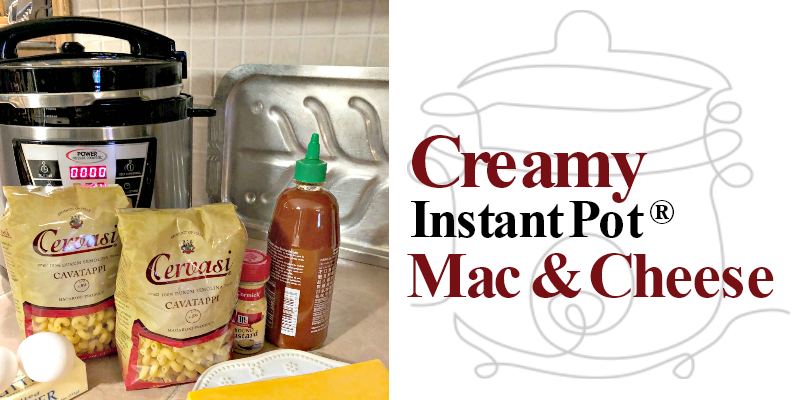 Here’s our Facebook fan’s new favorite recipe, Creamy Instant Pot Mac & Cheese, along with cooking tips she and her daughter provided us. Freshly grated is great. Use freshly grated cheese instead of pre-shredded cheese. It’s more work, but it’s worth it! Pre-shredded cheese contains cellulose powder which doesn’t break down to allow for smooth melting. And American cheese, please. Replace mild cheddar with American cheese. American cheese acts as an emulsifier to ensure a smooth finish. Low heat can’t be beat. Use low heat to melt the cheese, as high temperature may cause lumps in the cheese sauce. Mac & Cheese left to eat? We’ll be surprised if you have leftovers. But if you do, place macaroni and cheese in a cold pan, pour in some milk and reheat over low heat. Stir constantly with a silicone spatula. Then, enjoy the yumminess all over again! We hope this inspires you to try out a pasta-pleasing recipe in your Instant Pot! And if you do, let us know.